See Characters for more info. The Beast is the ruler of the Beast's Castle. Cursed due to his selfishness at not letting an Enchantress spend the night at his castle, he has taken on the appearance of a beast, hence his name. A year earlier, he risked his life to save his beloved Belle, a Princess of Heart, from "Ansem". Since then, he has been the target of an Organization XIII member named Xaldin. The Beast uses his claws as his weapon, and has high strength. His limit is Twin Howl. Auron is a mysterious warrior revived by Hades in the hopes of using him to kill Hercules. However, Auron refuses to work with the Lord of the Dead and joins Sora's party. He is the first Final Fantasy character to be an official party member. Auron uses a large sword in battle, and has high strength. His limit is Bushido. Captain Jack Sparrow is a pirate who's goal is to take back his beloved Black Pearl from his former first mate, Barbossa. He joins Sora's party after recruting them as his crew when he stole the Interceptor. Sparrow's main weapon is a sword, though he does have a gun, which he only uses once (but not in gameplay). His limit is Bluff. Aladdin is a former street urchan and another old friend of Sora. A year ago, he helped Sora and co. defeat Jafar and prevent Agrabah from being consumed by the Heartless. He is the fianceé of Jasmine, a Princess of Heart. Aladdin uses a sword in battle, and has good speed. His limit is Speedster. Jack Skellington is the Pumpkin King and the one in charge of Halloween. He has recently discovered Christmas Town, and wishes to deliver the presents to children for Santa Claus, much to everyone's annoyance. Jack is a magic user, and uses his bare hands as his weapon. His limit is Dance Call. Simba is the son of the late Mufasa, and the King of the Pride Lands. However, he fled his home as a cub after witnessing his father's murder, and was raised by Timon and Pumbaa. His uncle Scar took the throne for himself and told everyone that Simba died alongside his father. 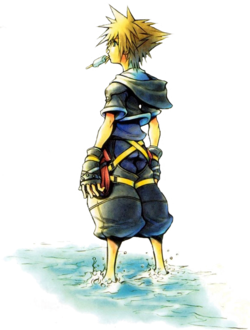 He is an old friend of Sora, since he serves as a summonable character in the original Kingdom Hearts. Being a lion, Simba uses his claws as his weapon, and relys on strength in battle. His limit is Wildcat. Tron is a security program of the Hollow Bastion OS. He was copied over by Ansem the Wise from ENCOM's system (which has seen been destroyed) and modifided. But soon, "Ansem" (really Xemnas) brought back the Master Control Program and things have been ugly since. Originally emotionless, he soon developed emotions after meeting Sora, Donald and Goofy. Like his Grid counterpant, Tron uses an Identity Disc in battle, though unlike Rinzler, he uses magic. Being a program, Tron's main element is Thunder. His limit is Setup. This page was last edited on 29 January 2013, at 17:22.